(Formal Commands). Formal Commands We use commands to give instructions or to ask people to do things. 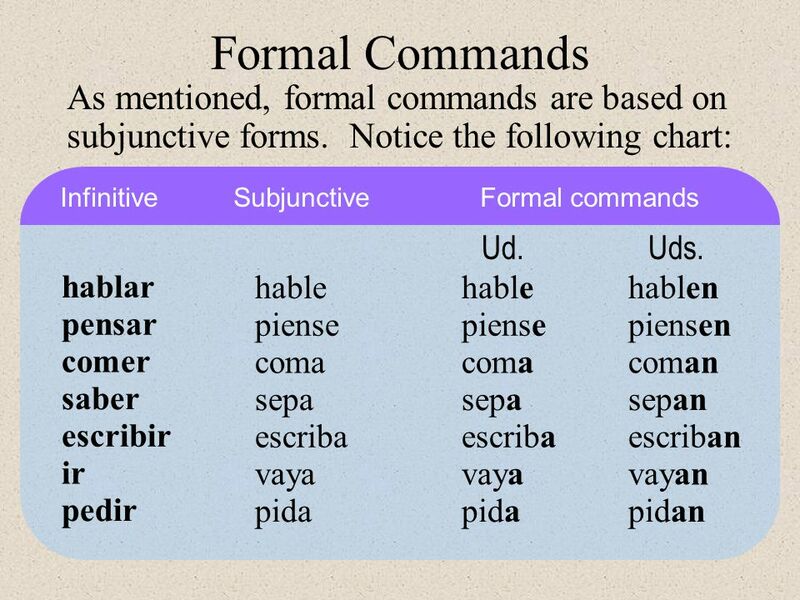 In Spanish, commands have different forms to distinguish. 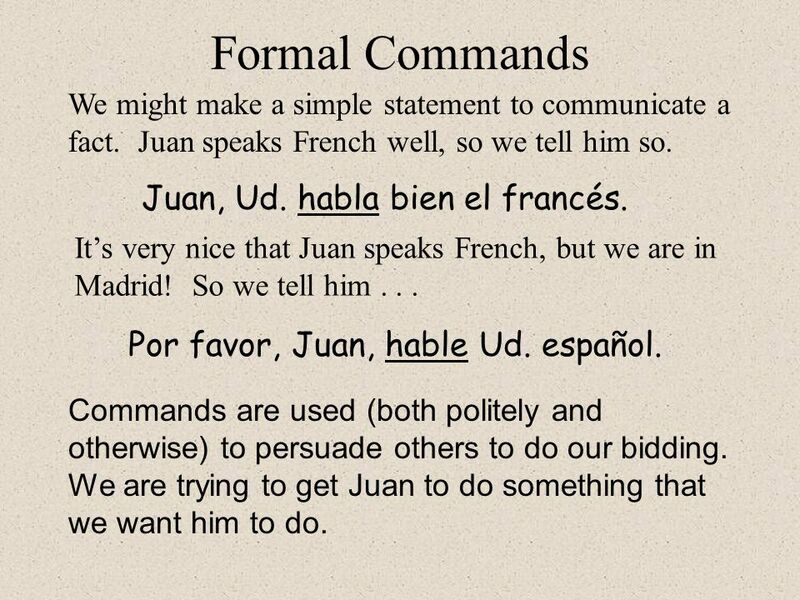 2 Formal Commands We use commands to give instructions or to ask people to do things. 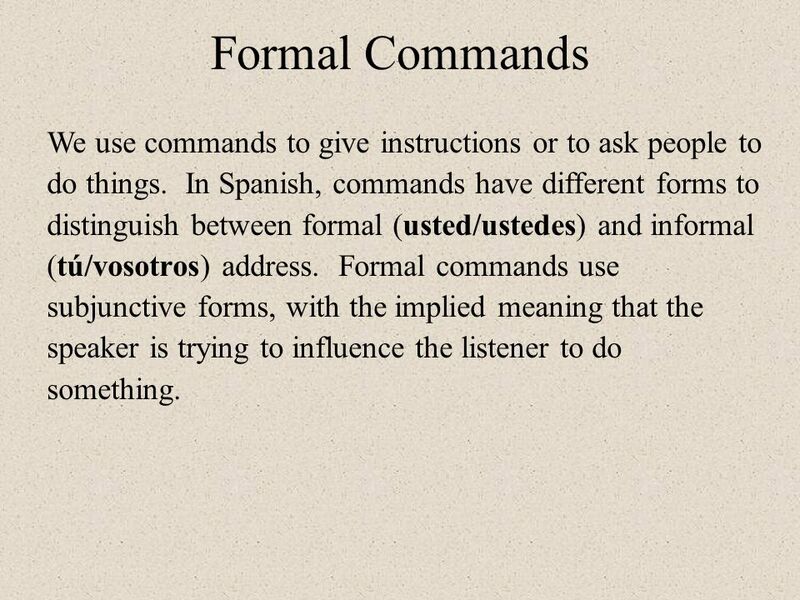 In Spanish, commands have different forms to distinguish between formal (usted/ustedes) and informal (tú/vosotros) address. Formal commands use subjunctive forms, with the implied meaning that the speaker is trying to influence the listener to do something. 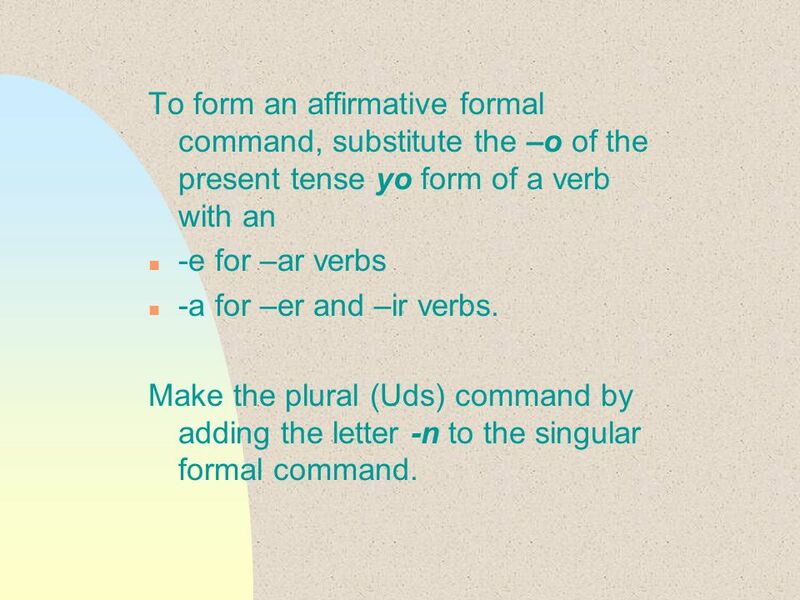 4 To form an affirmative formal command, substitute the –o of the present tense yo form of a verb with an n -e for –ar verbs n -a for –er and –ir verbs. Make the plural (Uds) command by adding the letter -n to the singular formal command. 7 Despida a ese empleado, Sr. Ruiz. 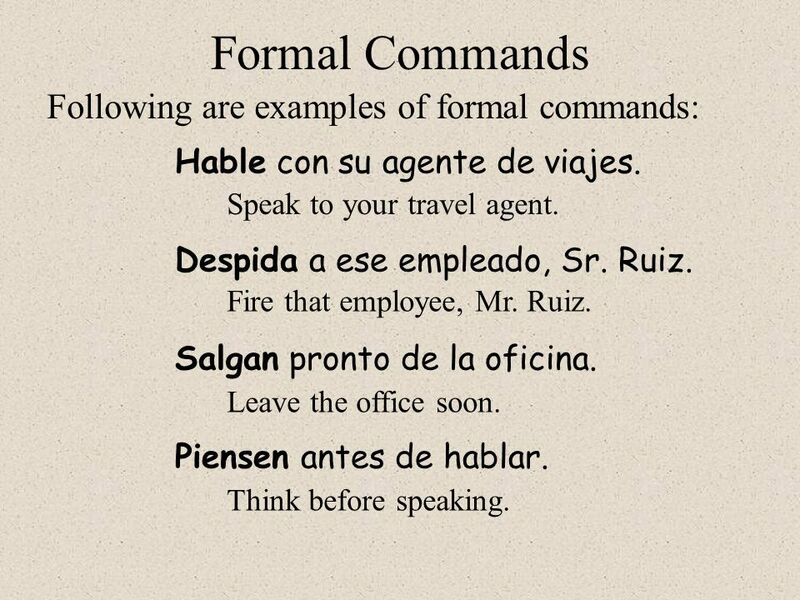 Formal Commands Hable con su agente de viajes. Following are examples of formal commands: Speak to your travel agent. Fire that employee, Mr. Ruiz. Salgan pronto de la oficina. Leave the office soon. Piensen antes de hablar. Think before speaking. 8 No dén propinas a todos los empleados. 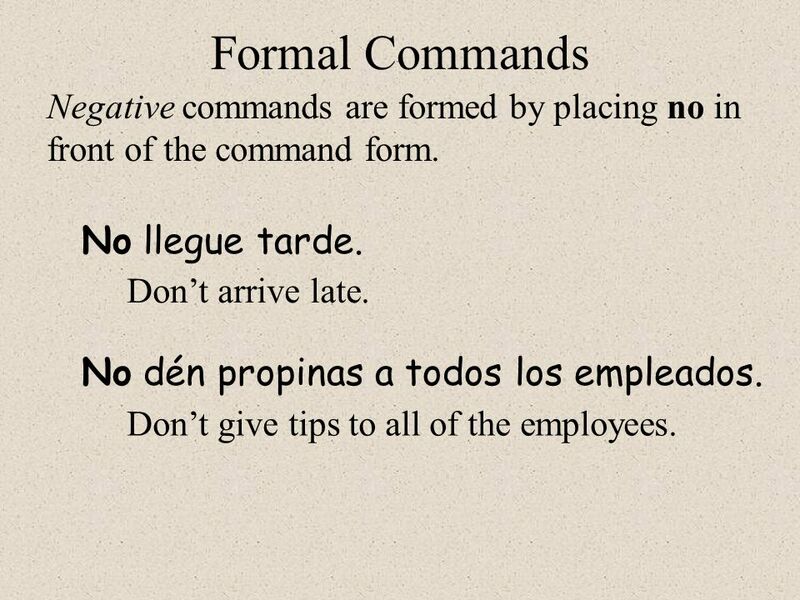 Formal Commands No llegue tarde. Negative commands are formed by placing no in front of the command form. Don’t arrive late. Don’t give tips to all of the employees. 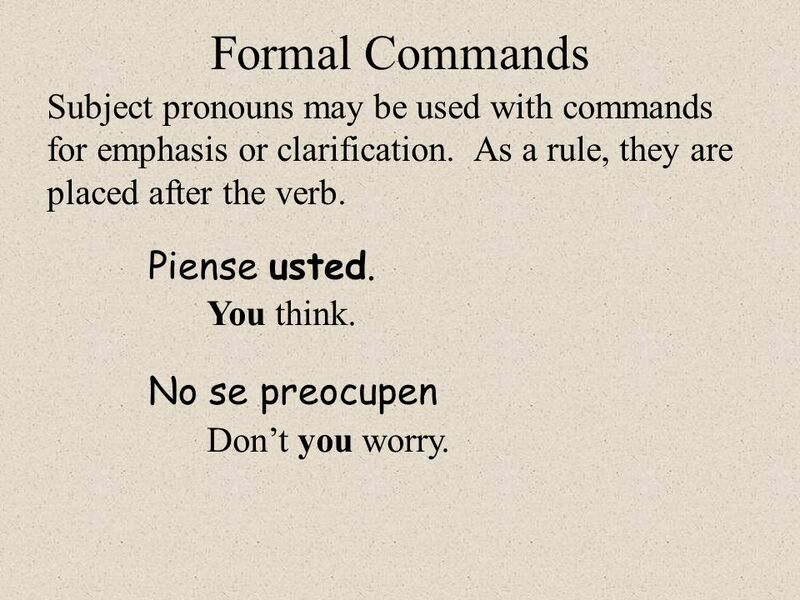 9 No se preocupen Formal Commands Piense usted. Subject pronouns may be used with commands for emphasis or clarification. As a rule, they are placed after the verb. You think. 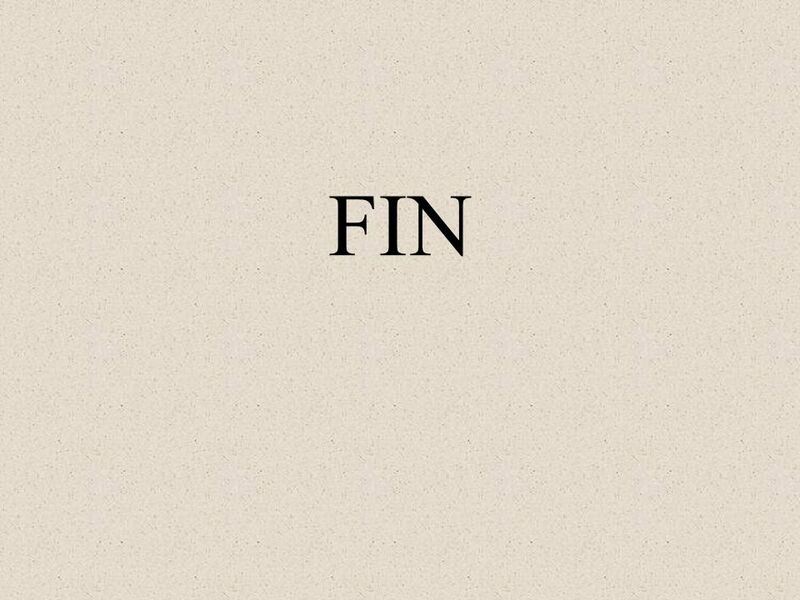 Don’t you worry. 10 Tráiganmelo, por favor. 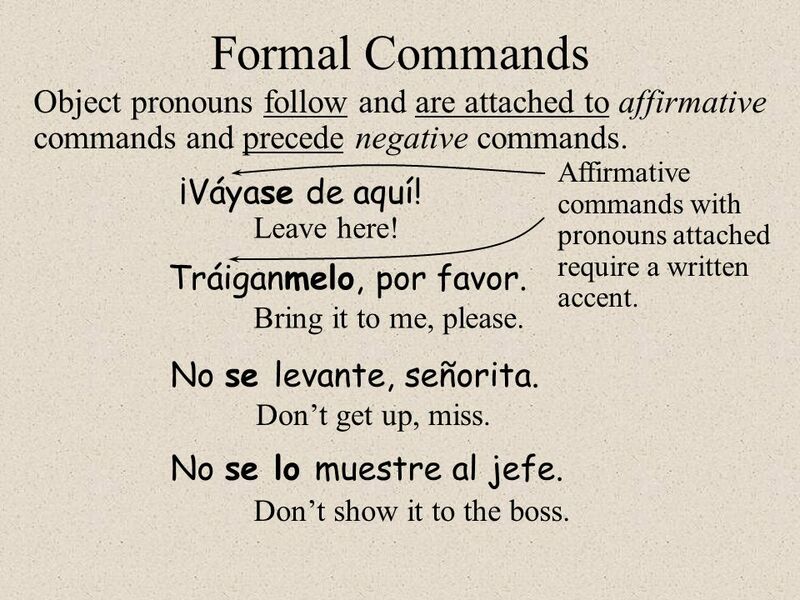 Formal Commands ¡Váyase de aquí! Object pronouns follow and are attached to affirmative commands and precede negative commands. Leave here! Bring it to me, please. No se levante, señorita. Don’t get up, miss. No se lo muestre al jefe. Don’t show it to the boss. Affirmative commands with pronouns attached require a written accent. Download ppt "(Formal Commands). Formal Commands We use commands to give instructions or to ask people to do things. 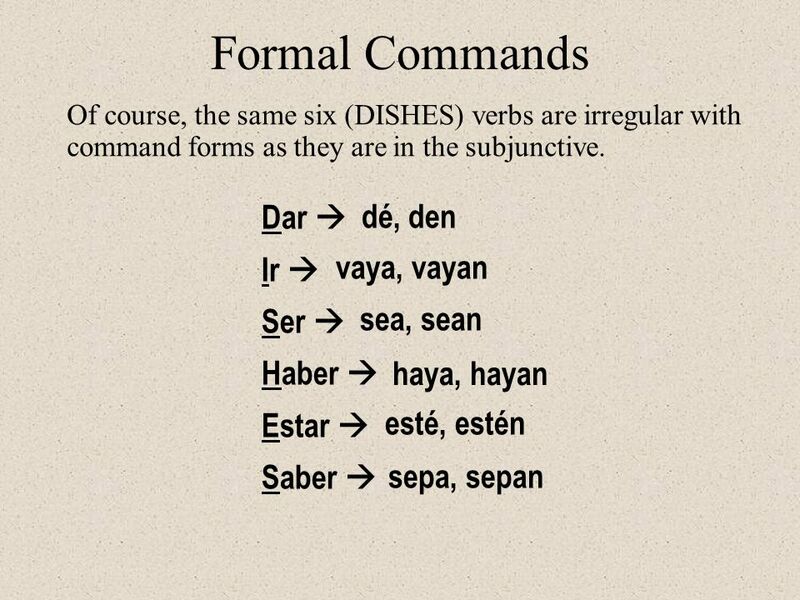 In Spanish, commands have different forms to distinguish." 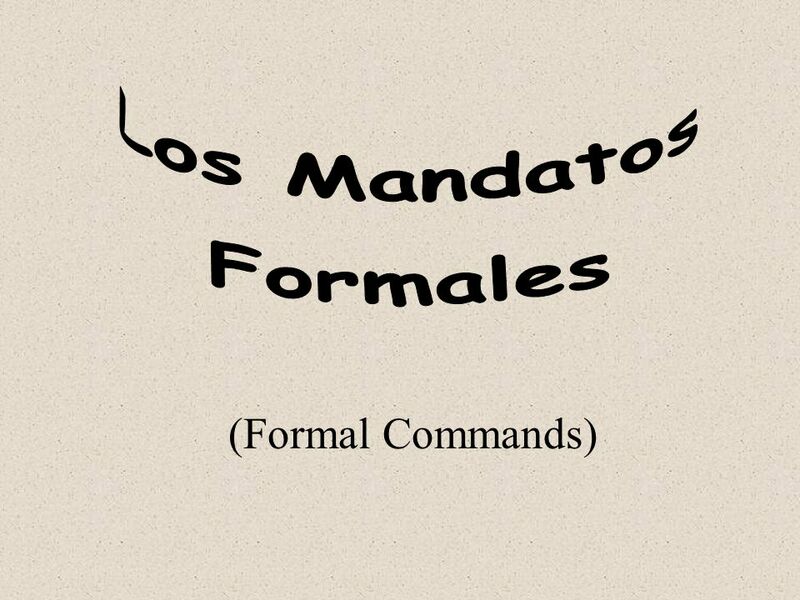 Los mandatos formales Español pre-AP/BI 2. Ud. and Uds. Commands Easy rule to remember: *Go to the yo *Drop the o *add the opposite ending -ar e, en -er/-ir a. an. Tú Commands (Los mandatos de la forma tú) Dame la linterna, por favor. Negative Tú Commands Mandatos Negativos Negative Tú Commands 8To form negative tú commands with regular verbs, we drop the o of the present- tense yo. Negative Tú Commands Español 2 Capítulo 12 Página 412. Las partes del cuerpo WRITE OUT the following sentences with the correct body part. n Cabeza/dientes/espalda/estómago/mano/pulmones n M ODELO : Guardo.  In English, commands almost always stay the same. Stop! is Stop! regardless of who you are speaking to.  In English when you include yourself in a.